Make use of our letter template to help to come to a perfect personalized version. The objective of writing this letter is to request a period of leave for a temporary or permanent medical leave. Whether the letter is formal, or not, we advise putting the reason for the leave in the first paragraph of the letter's body. Please understand that if you are drafting a wrong or a false leave letter, this may create bridges of misunderstanding. Therefore, we recommend to first, analyze the reason behind the medical leave and then draft a letter accordingly. Make sure you have taken enough time to inform those who might be affected by your leave, so they can take the appropriate precautions. Close the Approval of Medical Leave of Absence Without Pay without an indentation, leaving three or four lines for your signature between the closing and your typed name and title. Please note this template is provided for guidance only. 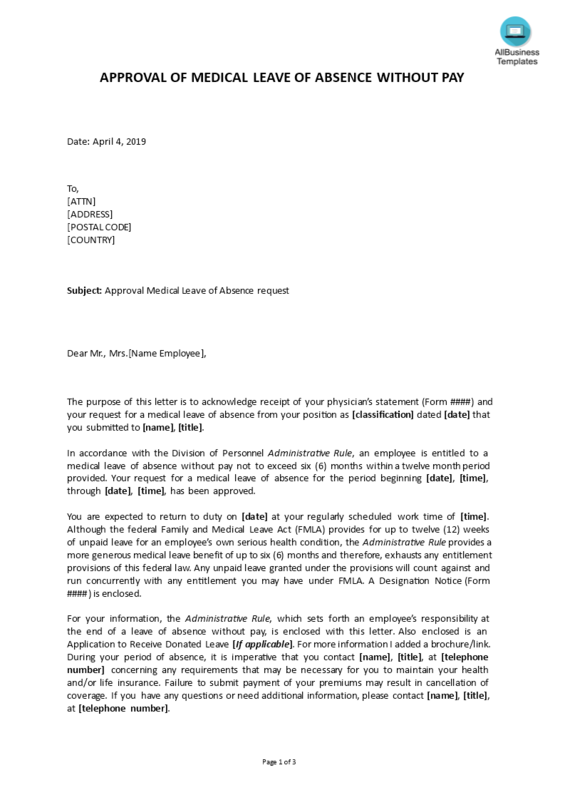 Download this Medical Leave Approval Without Pay letter template to write a perfect (and personalized) letter, edited to fit your personal situation. If this letter does not fit your requirements, please also have a look at the topic: Leave Letter Templates.